My sermon from the 2nd Sunday of Easter (April 8, 2018) on 1 John 1:1-2:2. Listen to the recording at the bottom of the page or read my manuscript below. So if it’s okay, I’d like to spend some time today with y’all nerding out. But instead of digging into our shared love of comic books or which Star Wars movie is the greatest, I want to take us to another level. I want to spend time with something called P52. Well, P52 is just it’s nickname. It’s full name is Rylands Library Papyrus 52 and it looks like this Slide 1. It’s a 3.5 inch by 2.5 inch piece of papyrus located at John Rylands University in Manchester. And it doesn’t look like much. The papyrus is all brown and fragile. Its edges are jagged and torn. And the words written on it are missing most of their letters. In fact, the whole thing looks like maybe it was tossed in the trash and left in the Egyptian desert for 1900 years – which might actually be what happened. On first glance, P52 looks like a piece of junk. But it isn’t. That, right there, is the earliest written copy of anything we have from the New Testament. What’s on that scrap is the gospel according to John, chapter 18, verses 31-33. And it’s a copy of the gospel, dated to sometime between 125 and 175 CE, just a generation or two after that gospel was first written down. 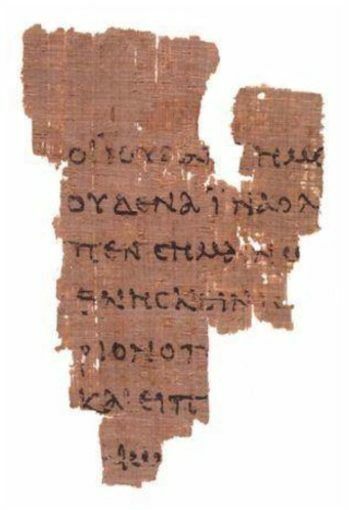 The bible we read today, the scriptures that structure our faith, are connected to that little scrap of papyrus that someone left in a trash can 1900 years ago. Now, that’s sort of mindblowing, right? I like to nerd out with old papyrus because we see how we are connected to a faith that is bigger than ourselves. Our belief and those moments in our lives when Jesus is very real to us – they are part of a wider reality of faith that includes everyone here and whoever held that piece of papyrus out in the Egyptian desert. As much as we in the church like to talk about our faith being a very personal thing – by using words like “my faith” or “I believe” or even “Jesus loves me” – the faith we have is also a very communal thing. Our faith connects us, unites us, and brings us together into a community that looks to Jesus for its life. What we do in worship today might sound different from what happened in Egypt 1900 years ago, but we are all connected to a Jesus who is both personal and communal. Our faith is not designed to be a solo activity. Our faith is a team sport. So for the next six weeks, we’re going to hang out in 1 John. 1 John is usually called a letter but it really isn’t. It’s more of a position paper, describing what they think the main themes from the gospel according to John are all about. But whenever someone writes down anything that says “this is what this means,” then we can be sure that there are others who don’t agree. Later on, we’ll discover that there’s been a split in the churches who first wrote and used the gospel according to John. And their disagreement centered on Jesus himself. One group, the larger and more successful of the two, decided that Jesus’ divinity, his status as God’s Son, was the most important part of who Jesus was. And since Jesus’ divinity was all that mattered, they decided that the rest of Jesus’ story – his humanity, his life, and his death – didn’t matter at all. For them, it was as if the opening chapter of the gospel according to John, the bit that described Jesus as being God and present since the beginning, was immediately followed by Easter. Everything in between was almost meaningless. It didn’t matter that Jesus was born. It didn’t matter that he was a teacher who always formed communities. It didn’t matter that he ate meals with people he shouldn’t, argued with the religious authorities, and healed those in need. And it especially didn’t make one lick of difference that Jesus ended up dying on the Cross. For the larger community, this framework created a kind of faith that was very personal, very individualized, and one that didn’t need really need the wider community. Because a faith that only cares about Jesus’ divinity, is a faith that doesn’t really care much about our everyday living. Instead, once that kind of faith feels like it already believes enough, then it starts acting as if life, right now, is meaningless to God. We can then make our life into whatever we want it to be, staying rooted in ourselves alone, and not in fellowship with the rest of the team. Now, I know this kind of faith sounds a bit odd to us. But imagine if we didn’t have Mark, Matthew, or Luke in our bible. Then a faith that doesn’t pay much attention to Jesus’ life and death is a faith that a certain reading of the gospel according to John, can be possible. It’s a faith that’s centered on me and God and… no one else. It’s a faith that looks to escape the world rather than spend time trying to live in it. And it’s a faith that doesn’t really value community because it doesn’t believe that a community is needed to make people grow. It’s a faith that, in the end, looks for Jesus but ends up leaving Jesus’ community behind. So, It’s to this larger, more successful, community that the author of 1 John was writing to. 1 John wasn’t written by the side that was the most powerful. And it was a letter that, in the end, didn’t really work at all because the two communities never reunited. 1 John is a piece of writing that failed it’s goal – yet it became part of our bible because, I think, it helped show all of us how faith is a communal effort. What we teach, share, and entrust to the next generation is a faith that grows, changes, and evolves in and through community. The gospel according to John needed Matthew, Mark, and Luke. And Matthew, Mark, and Luke needed the gospel according to John. Even the structure of our scripture itself shows us that we can’t be who God wants us to be unless each of us commit to following Jesus with each other. And so, the author of 1 John, begins his writing in the place where our faith starts: with an honest sharing of what was “from the beginning, what we have heard, what we have seen with our eyes, what we have looked at and touched with our hands, concerning the word of life.” Our personal story with Jesus – with its struggles, doubts, and joys – is a story that we are asked to share with each other. When we tell our story, we commit ourselves to this community. And when this community listens to these stories, all of us discover a little more of what following this Jesus thing is all about. The person in Egypt hearing about Jesus from P52 had no idea that us, here in Woodcliff Lake, would be talking, and sharing, and following that same Jesus 1900 years later. But the Jesus that gave that person in Egypt life, and breath, and held them through all things – is the same Jesus who is here, with us, forming us into a new community where walking in His light is all that we [including little Nicholas] do.